The United States’ muted profile in mineral-rich, landlocked Mongolia receded even more in 2014. Indeed, the US has largely stood by while Mongolia deliberately integrated its faltering economy closer with its two neighbors, China and Russia. 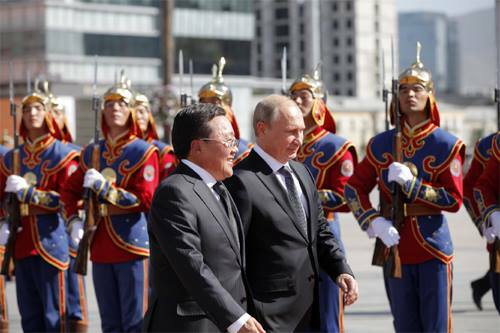 Last year, top-level Mongolian officials met with Chinese President Xi Jinping (August 20–21) as well as Russian President Vladimir Putin (September 3) in Ulaanbaatar. Moreover, Mongolian President Tsakhia Elbegdorj met with Xi and Putin in a trilateral format during the September 12 Shanghai Cooperation Organization (SCO) summit, in Dushanbe, Tajikistan. In boosting these economic links, Mongolia was reacting to the precipitous fall in foreign direct investment (FDI) from $4.4 billion in 2012, to $1.8 billion in 2013, to only $0.8 billion in 2014 (M. A. D. Mongolian Newswire, January 13, 2015). This trend, coupled with the 40-percent fall in the Mongolian tugrik versus the US dollar over the last two years (Bne.eu, January 15), has greatly weakened the once white-hot Mongolian economy and swelled its foreign debt. The US, which was Mongolia’s mainstay in promoting democracy and free market reforms 20 years ago, has been mostly distant and economically disconnected from the growth of Mongolia’s mineral economy during the last five years. American officials claimed that the absence of US investment was due to a “lack of transparency” and an unstable legal regime in Mongolia. They pressed Ulaanbaatar to control the country’s endemic corruption and adopt a bilateral transparency agreement. Although the two governments signed the agreement in September 2013 (Infomongolia.com, September 25, 2013), opposition in the Mongolian parliament to some of its terms delayed its ratification until December 5, 2014 (Bcmongolia.org, December 12, 2014). The website of the US Embassy in Ulaanbaatar hailed the significance of the document’s ratification as “an important milestone in the U.S.-Mongolia trade relationship.” But the transparency agreement ratification received almost no coverage in Mongolia’s media beyond government sites (M. A. D. Mongolian Newswire, December 8, 2014). Credit for the transparency agreement’s ratification in the fall 2014 parliamentary session—in the midst of a Mongolian governmental collapse and reorganization—goes to President Elbegdorj and his Democratic Party, who believed it was the key to unlocking Washington’s agreement to a second Millennium Challenge compact—the primary vehicle for US financial assistance in Mongolia. On December 11, Elbegdorj was phoned by the CEO of the Millennium Challenge Corporation (MCC) with news that the country was selected for its efforts to improve controlling corruption and enhance “good governance” (The Mongol Messenger, December 19, 2014). Elbegdorj emphasized that this selection “demonstrates the United States’ significance to bilateral relations of the two countries and democratic development in Mongolia. (Infomongolia.com, December 15, 2014). The selection was prominently covered in the Mongolian media, even though the amount and type of aid has yet to be negotiated. Negotiations over the next several months will focus on specific projects to improve the legal environment and implement the Mongolian government’s private sector policies. Mongolia hopes that MCC Phase II will have greater success than MCC Phase I (2008–2013). The majority of Phase I’s $285 million originally was allotted to modernizing Mongolia’s Ulaanbaatar Railway (UBZD). However, when Russia, which own 50 percent of UBZD, blocked this plan, the Phase I funds were diverted to vocational training, strengthening land leasing property rights, reducing non-communicable disease rates, fighting air pollution, and building an all-weather road (Mcc.gov, September 9, 2013). These projects were promoted to the Mongolian public as poverty alleviation measures, but had limited impact and pale in comparison with the several billion dollars’ worth of Chinese-funded infrastructure projects and newly negotiated Sino-Russian-Mongol Eurasian Silk Road transportation construction initiatives. Ultimately, Mongolia had to negotiate with Russia a different modernization model for the UBZD, the nation’s only north-south rail line (Ubtz.mn, September 3, 2014; Railwaygazette.com, September 4, 2014). The two nations are expected to announce financial and technical feasibility rail studies by March 1, 2015, with a completion target of 2020 and financing promised by China—effectively excluding the US from major Mongolian rail development. The Mongolian government in the fall delayed a final decision about foreign participation in the development of the 100-percent state-owned Tavan Tolgoi (TT), one of the world’s largest (7.4 billion tons) untapped coking and thermal coal deposits, 240 kilometers north of the Chinese border. The two finalists were the US Peabody Energy Corporation and a joint consortium of Mongolia’s Energy Resources LLC, Japan’s Sumitomo Corporation and China’s Shenhua Energy Co., Ltd. However, as soon as Mongolia was selected for the MCC Phase II compact, Ulaanbaatar announced it had accepted the Mongolian-Japanese-Chinese consortium bid (Infomongolia.com, December 23, 2014)—dashing hopes for a sizable infusion of US FDI. Mongolian authorities explained that the winning consortium had agreed to invest, without strings, around $4 billion; promised to assume the remaining $160 million in debt for TT that the Mongolian government owes to Aluminum Corporation of China (Chalco) (Infomongolia.com, December 12, 2014); and pledged to construct new TT railroad spurs that could move the coal to northern and southern markets. US officials from the Department of Commerce and Department of State did not mask their disappointment over this news; but in private discussions, they indicated that they still were optimistic a significant role for Peabody Energy would be found. The World Bank forecasts Mongolia’s annual GDP growth will slow to 6 percent in 2015, down from 6.3 percent in 2014, and 11.7 percent in 2012 (Worldbank.org, January 14). Furthermore, Mongolia needs to develop an action plan to refinance or repay its external public debt of $1.08 billion by 2017–2018. Mongolian democratic leaders understand that without tighter economic policies and more FDI, their economy will remain vulnerable, pushing Mongolia even closer toward China and Russia. While they have reached out to other “third neighbors,” such as Japan, Germany, and several countries in Southeast Asia, to find additional investment, they still are eager for significant US economic ties. Both the United States and Mongolia recognize that continuing economic weakness plagues the bilateral relationship and encourages Chinese and Russian influence in the country and the whole Eurasian region. US retrenchment has damaged the country’s public reputation in the region by increasing the sense of abandonment in the minds of the Mongolian citizenry and in some official circles. While the failure of Peabody Energy to win the TT contract appears to be another sign of the US’s inability to compete in Mongolia’s mineral economy, it is hoped in both Washington and Ulaanbaatar that the MCC Phase II compact will be able to halt the further slide in US influence.